The study of Chinese traditional music, particularly that for the guqin, has a profound influence on my approach to composition and on my attitude to music in general. Spaciousness, timelessness and timbral subtleties play an important part. More robust rhythms also take an integral place in my compositions. Tony Wheeler is a performer (clarinet, saxophone, guqin and ruan), composer and teacher. He was born in New Zealand in 1958 and has spent most of his life in Australia, as well as a considerable number of years in Asia. He studied clarinet and composition at the Queensland Conservatorium of Music, where he first made contact with Chinese traditional music. After graduating in 1982 with a Bachelor of Music, he worked as a freelance performer and teacher before being awarded a scholarship to spend two years (1985-7) at the Shanghai Conservatory studying Chinese composition, ruan (Chinese four-stringed guitar) and guqin (ancient seven-stringed zither). After leaving Shanghai, Wheeler then spent four years studying and teaching at the University of Hong Kong before receiving a Master's degree in Composition for Chinese Instruments. He studied guqin with Lin You Ren in Shanghai, and with Lau Chor Wah in Hong Kong. 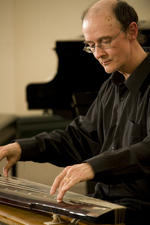 As well as maintaining a busy teaching schedule, Wheeler composes in a wide variety of musical genres and styles, and his compositions have been performed and broadcast in Australia, Japan, China, Hong Kong, Europe, the USA and Canada. His study of Chinese music, in particular that of the guqin, has had a profound and enriching influence on his composition, improvisation and approach to and practice of music in all contexts. Wheeler has extensive experience in performing Western orchestral, chamber, solo, contemporary and improvised music. He is the founder and musical director of the Sydney Sizhu Ensemble, a group of traditional Chinese instrumentalists playing traditional repertoire, some arrangements and original compositions. He frequently performs on Chinese and Western instruments in a contemporary and/or improvisatory context. Frequent collaboration with Dr. James Franklin (shakuhachi) has resulted in a body of improvisation-based repertoire, some of which appears on the CD Moon Road To Dawn (Celestial Harmonies 1999). Also, he has performed with Professor Michael Atherton (guitar, percussion) several times at the National Folk Festival in Canberra, and their work has resulted in the release of the CD Nine Elemental Songs (Wirripang 2008). Wheeler's more recent compositions include a duet for clarinet and flute (also arranged for clarinet and shakuhachi), a solo flute piece written for Natalie Wood, collections of blues studies for clarinet and saxophone, a fugue for clarinet and piano, Suite Modale for flute, clarinet and bassoon, Song for Toby for bass guitar and piano, Blue Moon for tenor sax, erhu and piano, and a number of educational publications. He also continues to translate and reconstruct ancient music for the guqin from the traditional Chinese tablature. In 2011 his reconstruction from traditional guqin tablature of Gu Jiao Xing ('Walking with the Ancients' from 1614) was accepted for presentation at an international guqin score reconstruction conference in Changshu, China. It was then published by the Shanghai Music Publishing House in a volume of works selected from the conference. in 2012 he was elected Council Member of the China Kun Opera and Guqin Research Society. The composer says: 'The study of Chinese traditional music, particularly that for the guqin, (ancient Chinese 7-stringed zither) has had a profound influence on my approach to composition, and on my attitude to music in general. Spaciousness, timelessness and timbral subtleties play an important part, though more robust rhythms also have their place'.